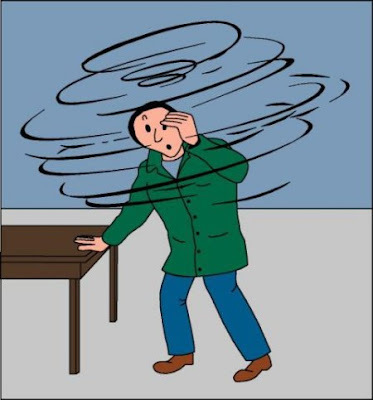 Vertigo triggered by changes in the position of the head and neck - such as tipping the head up or down, lying down, turning over or sitting up in bed - is a specific type of vertigo disorder known as Benign Paroxysmal Positional Vertigo (BPPV). Symptoms of dizziness and spinning may range from mild to severe and can result in nausea and vomiting. Additional symptoms of malaise, hearing loss, tinnitus (ear ringing), and a feeling of ear fullness or pressure may accompany the vertigo symptoms. While the exact cause is unknown, many vertigo patients report a precipitating event - an incident of physical trauma directed at the head and neck. In fact, medical researchers increasingly are naming head and neck trauma as a primary cause of vertigo onset; however, onset of trauma-induced symptoms may be delayed for several months or years after trauma. Researchers believe that head/neck trauma triggers changes in the brainstem, including abnormal nerve transmission and neurochemical production. This disruption of brain function can lead to vertigo symptoms. Common sources of trauma include blows to the head, whiplash and/or concussion sustained as a result of motor vehicle accidents, falls, and through high-impact sports such as surfing, soccer, gymnastics and horseback riding. Any of the above may cause ligaments supporting the head and neck to be sprained (stretched,) which forces the upper cervical (neck) vertebrae out of their normal biomechanical position. This upper cervical misalignment can affect brain function and lead to the onset of vertigo. A chiropractic technique that focuses upon the alignment of the upper cervical vertebrae, known as upper cervical care, provides a unique approach for treatment of vertigo. Upper cervical chiropractic care utilizes two diagnostic tools - thermal imaging and digital X-rays - to accurately assess an upper cervical injury. After determining a diagnosis of cervical injury, each patient's injured neck is corrected by administering a precise adjustment by hand on a specially designed knee chest table. Many patients notice improvement in vertigo symptoms with just a few treatments. With over 20 years of experience as a specialist in the upper cervical spine, Upper Cervical Chiropractor Dr. Erin Elster, D.C., has been working with individuals with vertigo for the past three years on Maui. For more information on Dr. Elster's research with vertigo patients, contact Dr. Elster in Kahului at (808) 866-6551 or www.erinelster.com.